NEW LISTING! Gorgeous!!! 4 bed 3 bath home! Recently remodeled, beautifully furnished! Gently nestled in the spectacular Aspen grove high about the country club you will find this gem waiting to be discovered by someone that appreciates it's secluded location with direct access to the National Forest to its handsome log structure. This home offers comfortable mountain living. 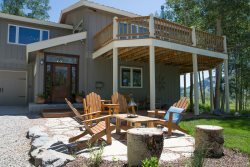 The large windows accompanied with generous decks bring the outdoors in while the abundant Aspen trees gives the property the feel of true privacy. The great room boasts large log beams, vaulted ceilings and a river rock fireplace. One of the most comfortable and desirable floor plans with four bedrooms and two living areas that has ample room for the larger or extended family. Amenities include the over sized decks and the three car garage designed for extra toys like a boat or golf cart to fit in from the side door location of the third bay. We know there are tree lovers that would be totally excited to find this home.